Last Saturday, we had a collective cooking with the most recent cooking group, this is now our third meet-up. The couple decided to take on the entrees. We have here another great blend of flavours of sweet, sour and freshness from this dish similar from their last dish with shrimp and grapefruit salad. Potato salad can be made in so many different ways and each country has its own style. 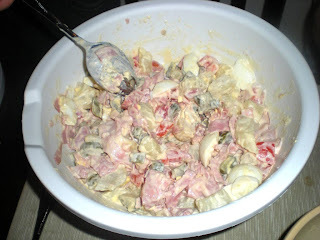 Piémontaise Salad is an entree from France which consist of a mix of tomatoes, ham, pickles and hard-boiled eggs. 1. In a large pot, cook potatoes with skin on for 20 minutes in boiled salted water or cut into pieces using a pressure cooker to keep its texture. Set aside, cool and peel. 2. To avoid cracking, put eggs in warm water and cook it for 10 minutes in boiling water. 3. Remove seeds from tomatoes and cut into small cubes. Dice ham and cut pickels into small pieces. Remove shell from eggs and cut into large pieces. 4. In a medium bowl, combine tomatoes, pickles, ham, eggs and potatoes. 5. Mix in the mayonnaise and season with salt and pepper. Refrigerate for an hour. Serve. Bon appétit!